For a great deal of us it’s inevitable that at some point we’re going to get handed a project that is less than inspirational. But with the deadline looming and your creativity threatening to never return how can we rekindle that love you once had? To tackle this very issue a while ago I took a step back from my work to take a closer look at what put that spring in my step when coming up against those potentially uninspiring hurdles of doom. Through the insight I gathered from critiquing the life cycle of my past projects, some sadly proving to be less successful than others. I boiled my process down to its fundamentals to create a new working process, The Nine Principles of Thought and Construction, that I could apply to various new endeavors to avoid those disheartening lulls that plague even the most creative of thinkers. At first reciting these nine principles in an order that sounded pleasing I thought I’d cracked it, but there was still something missing. Potential: Materials and information required to further the current state. Deconstruction: The exploration and relations between collected data. Manipulation: Amendments and alterations made to the current state. Repetition: Knowledge gathered through the recurrence of events. Composition: Structure or arrangement of elements. Unreliability: Removal and interrogation of potential inconsistency. Contrast: Juxtaposition of resources to provide depth. Enhancements: Improvements and value delivered. Dilapidation: Expected life cycle of outcome and augmentation of degradation. The above process, while high level enough to provide a solid foundation to a range of projects lacked the freedom to spark up those lightening bolts of inspiration that strike us when we least expect it. Realising that producing truly creative and innovative solutions isn’t something that can be scripted, I discovered that the something missing was chance. Asking myself how I could introduce this elusive factor, while retaining the efficiency injected into industries of a repetitive nature through application of refined and efficient process. I placed focus on the unknown by separating out the once rigid order of my principles onto flash cards, that could then be applied iteratively to my work. You can use the final cards and system below to provide a starting point to get deeply involved in even the blandest of projects. Keeping efforts short and focused to prevent stagnation reveal a card, explore the subject matter as prompted. Revealing the next card approach your existing research from the new point of view, continue to do this until you build up a basic range of ideas you would like to explore, you may want to deliberately revisit some of the principles to see how your generated ideas stand up. The random order allows the process to evolve while providing a focal point. This approach often takes me down avenues for potential solutions I may not have discovered while following a more rigid process. Providing an interesting way to apply a critical point of view to my discovery process and the creation of a wider range of solutions. Through pursuing this project I discovered that what kept my momentum in full swing wasn’t just the satisfaction of a job well done, but also the opportunity to explore and grow when delving deeper into new subjects. I hope this method helps you stay active when facing your own challenges. Remember it’s the gaps in between where we can gather the skills and experience we need that provide us with the momentum to leap over those potential hurdles of doom in the future. Introduce the user and their experience with your product at the core of your development process. As technology moves forward in leaps and bounds consumers now have more choice than ever. Voting with their feet leaving products that don’t meet their requirements “dead in the water”. Companies and teams have to make considerable effort to not only keep up with competition but also listen to the user, developing products to meet their specific needs. This booklet is a tool to give you a starting point to, gather requirements, declare and test your assumptions and obtain user feedback to further your product in line with your business goals. It allows you to place focus on Invalidating your hypothesis before making costly mistakes. Printed double sided on a3, the booklet can be cheaply reproduced from your copier and after one simple cut and a few folds be easily assembled following the printed instructions. Distribute among your team and work to a design studio method, by involving all members in the creation process, breakthroughs as well as a greater shared understanding of who the customer/user is, can be established at an accelerated rate. Once your team has had time to research and sketch their own solution to the issue or future development. Unfolding the six sketching pages into one strip allows team members and stakeholders to present their views on what would best deliver value, following up with a discussion session to decide what the best collaborative path to follow is. The workbook provides not only a sketching surface but six useful pages for prompts, organisation and feedback aiming to place greater focus on research and communication. Tasks to create and organise user stories on 3x3in (standard size) sticky notes into, “doing”, “related” and “?” (questionable for further clarification from users) means you can keep sight of the goals you are trying to achieve. 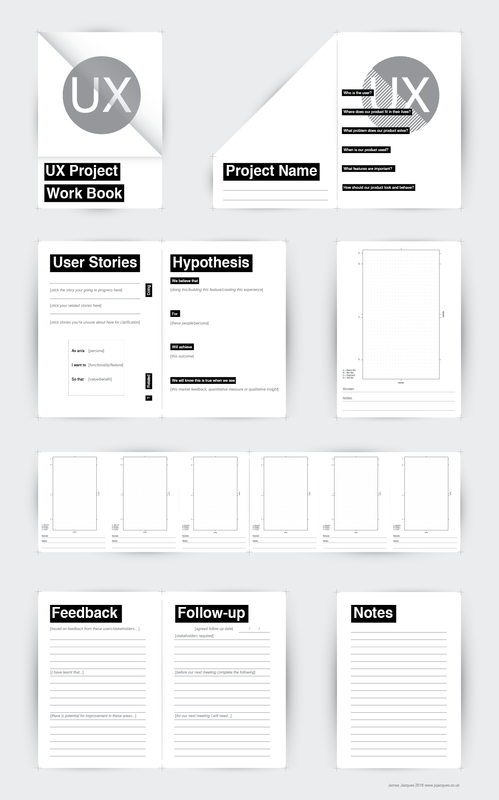 The booklet can be refolded to alter the starting point of the book so you can work from hypothesis to prototype to feedback pages showing the users only the feature your prototype is to address. If you would like to try the template for yourself, you can download it here. I’d love to hear about what you think about the template so please feel free to email me your thoughts.